Every major religion has some literary work as the backbone of their dogma. Christianity has the Bible. In the Old Testament, the story of brother versus brother serves as an example of theology. The story of Caine and Abel emerges in the Bible as an example of filial piety that conflicts with man’s personal devotion to God. Modern Ages fans will appreciate the detailed opposing point of view to the biblical foundation for the father of all Vampires, Caine. Told from different points of view, the Book of Nod offers insight in the form of prose. The verses lend an air of mystery to the legends. 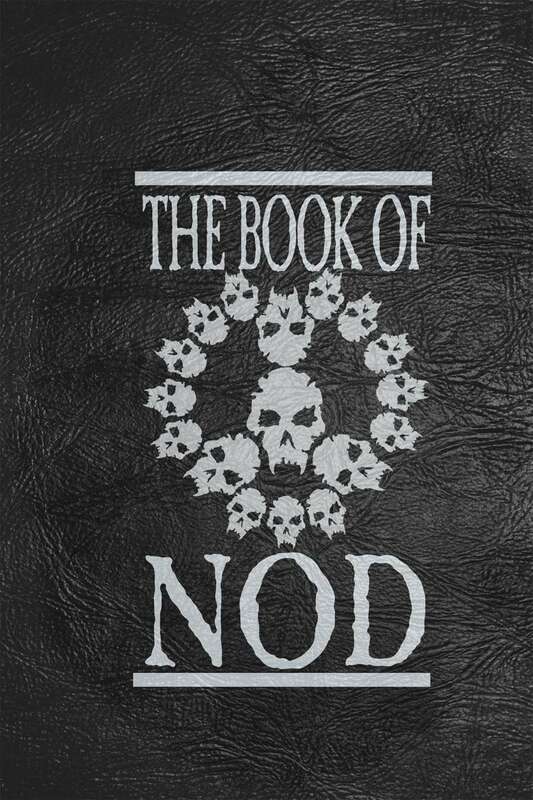 In this way, the Book of Nod performs the function of being a background for a vampiric religion without revealing too much. The prose does give some facts about vampiric lore. Yet, it is also written in such a way that the reader will speculate as to the true nature of events that have either come to pass, or events that have yet to occur. The structure of the book is surprising, in that the prose is heavily footnoted. Told from a vampiric scholar’s point of view, the research for the book is both entertaining and curious. One can almost feel Aristotle’s frustration as he cross-references words from crumbling parchments. One can also hear the voices of the ancients, as they live again through prophetic parables and historic prose. The footnotes are written in character and contain curious references to other characters in the game. This adds to the potential for the book to be used as a prop or a mood-setting item. Writing a book on a legendary topic is challenging, creating or attracting artists to illustrate the work is next to impossible. The art in the book, for how it was designed, was of a good caliber. However, in order to truly do a book of this nature justice, it would almost have to be hand-designed in order to truly be an author’s work. For how the book is presented in black and white, the artwork does a great job of adding a feel to the words it portrays. In some places, the printing is too dark and nearly impossible to read. Any lighter, however, and the book would lose its pen-and-ink appeal. Most curious about the Book of Nod, is that it acts as a valuable resource on several, different levels. For those that play Noddists in the Modern Age, the book serves as both a prop in game and a curious resource out of game. It may also be read to set the mood for the game, or to contemplate storylines from its obscure character references and anecdotes. Leatherette bound and silver embossed, any fan of the legend of Caine will find this book to be an entertaining resource to add to the aura and mystery of vampiric legends.